Wish you a very happy and prosperous new year. Today is my first post of 2015 ! I was thinking to start with a dessert but changed my mind. Because I posted enough of sweet dishes in last few months. Our taste buds need some tangy and spicy stuff now. So how about Indo-Chinese? I have talked a lot about Indo Chinese cuisine in some of my earlier posts. Me and my family both are pretty passionate about this specific category of Indian food. Some of my readers may be wondering what is this Indo-Chinese cuisine. In my Chilli chicken post,( read here ), I briefly talked about the evolution of Indo-Chinese concept. India has absorbed and adopted flavors and food from every foreign footsteps that left marks in the country. The migration of the Chinese and their cuisine cannot be undermined. We have selectively picked the ingredients and flavors to pair them up with Indian choice of vegetables and meat. 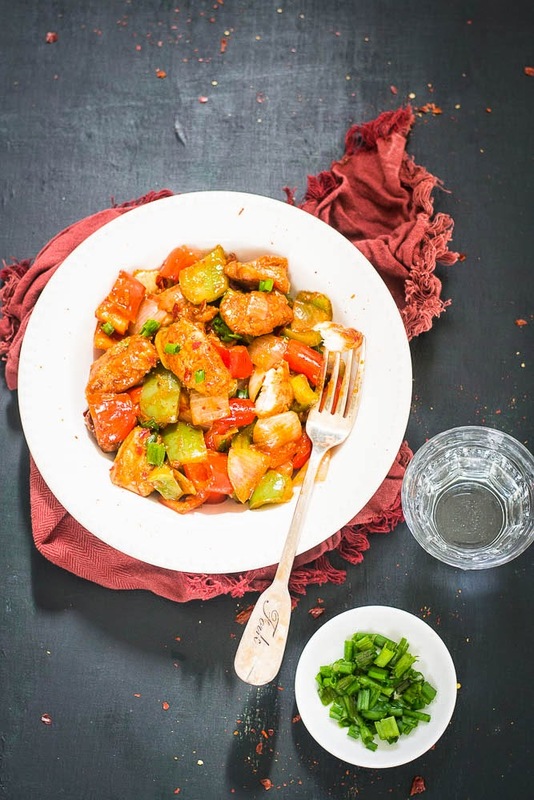 There are a lot of Indo Chinese recipes that named with prefix “Chilli” such as Chili Chicken, Chilli Prawn, Chilli Gobi, Chilli Paneer and Chili fish. 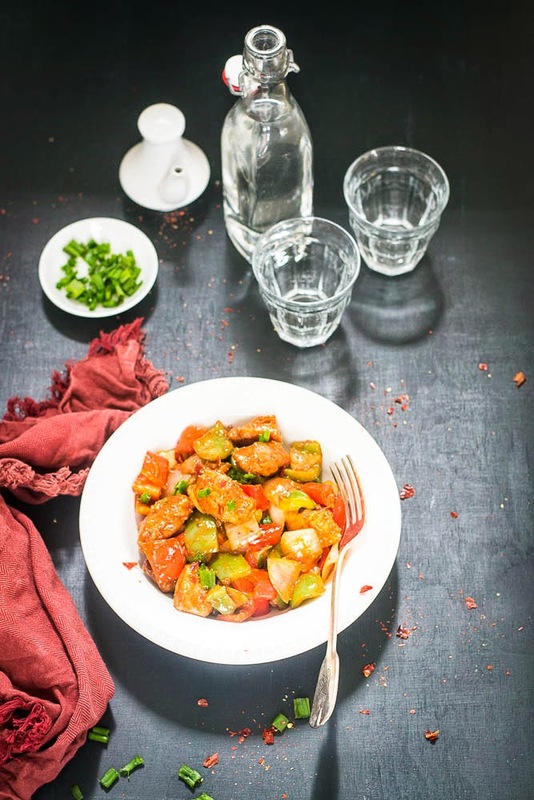 Then there are dishes with suffix “Manchurian” that come with meat, Panneer and vegetables like “Gobi”. The process is very similar to authentic Chinese cuisine - briefly marinate, stir fry and coat in a spicy and tangy soy based sauce. 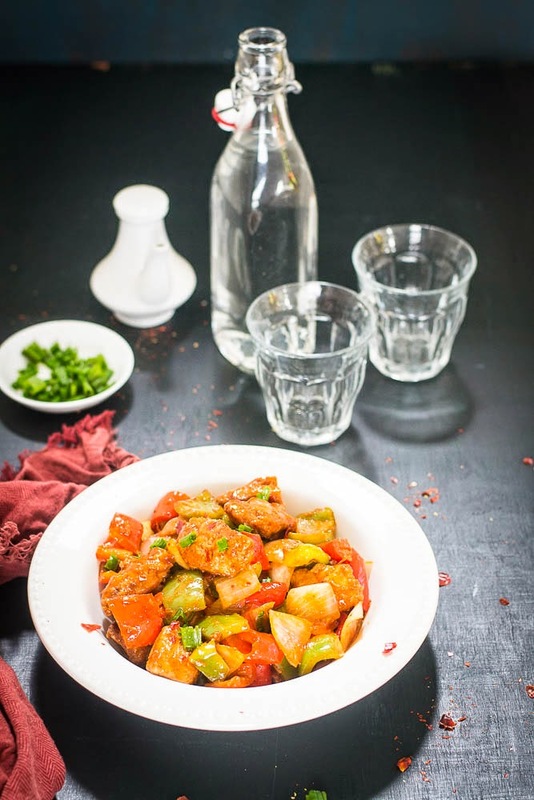 Today I am going to share Chili Fish Manchurian that is very popular dish in many Indian restaurants. 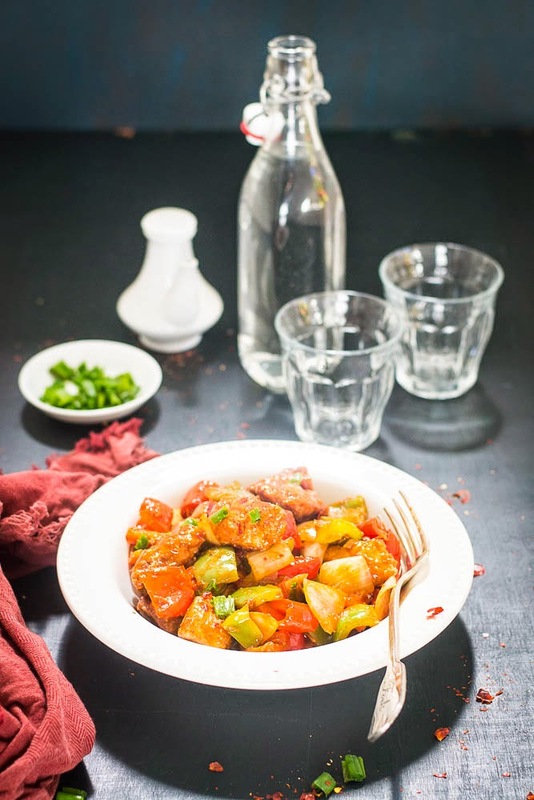 In general Fish Manchurian or Chili Fish Manchurian refers to a type of dry fish preparations. There is no standard recipe for it and everyone makes their own version of this dish. There are several variations of this particular recipe. More commonly boneless fish fillet are used. 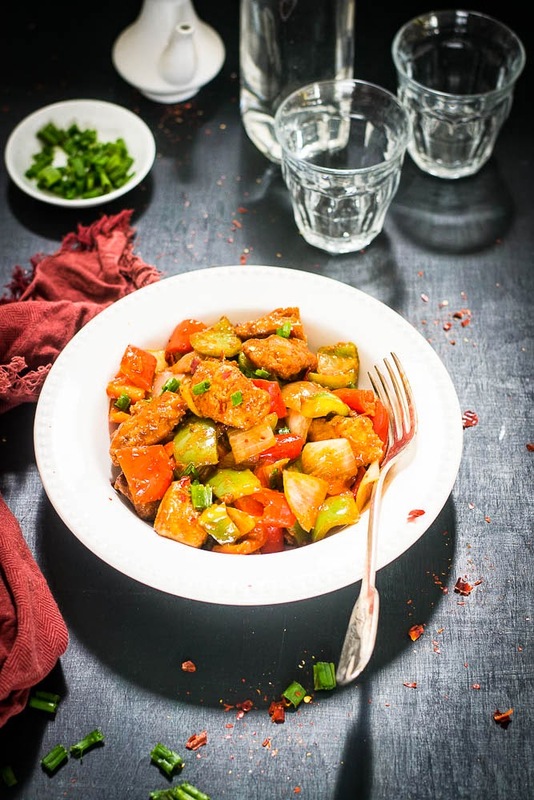 Batter-fried fillet cubes are stir-fried with bell-peppers in a spicy and tangy soy based sauce. This recipe works best as an appetizer, but you can thoroughly enjoy as a side dish too, especially with Chinese (Indo) Fried Rice, or Chinese mixed noodles. Onion : half of a small onion cut into 1 inch chunk. Green Bell pepper : 1 small, chop into 1 inch sized square pieces. Red Bell pepper : 1 small, chop into 1 inch sized square pieces. 1. Take a big bowl and place the fish pieces into it. Add vinegar, ginger paste, garlic paste, soy sauce, to it. Mix it well and let it rest for 10 to 15 minutes. 2. Take a bowl, add corn flour and plain four. Add water and make a thin batter. The batter should not be runny. 3. Dip the marinated fish pieces in the batter one by one and deep fry fry in hot oil. Fry them until the color changes into golden brown. Once done, set it aside. 4. In another wok or a pan, add two tablespoons of oil and heat it up. Add onion, stir it for couple of minutes, then add the bell peppers. Give them few stirs. Don't overcook, the bell peppers and onion should remain crunchy. Add minced ginger and garlic. Stir fry for a minute and add red chili flakes. Stir it again. Add the fried fish pieces to the pan. Add tomato ketchup and soy sauce and mix it well. 5. Take a bowl add 1/2 cup of water and corn flour to it. Stir it to dissolve well. 6. Gradually add the the mixture to the pan. Stir continuously till it starts boiling. Stir and mix until fish pieces are well coated with sauce. Check the seasoning and add salt, sugar or sauces if needed. Serve hot as an appetizer, or as a side dish too, especially with Chinese (Indo) Fried Rice, or mixed noodles. We are fishy family. Every week I cook more than 2 lbs fish for my fish-lover husband and son :-) We eat fresh fishes mainly, so choices are Salmon, Swai, Tilapia , halibut. For curries, I use salmon, Tilapia, Swai. For deep fry Swai is good and for Tawa Fry Salmon in best. I like chilli fish manchurian, Its taste is very nice. Thanks for sharing.